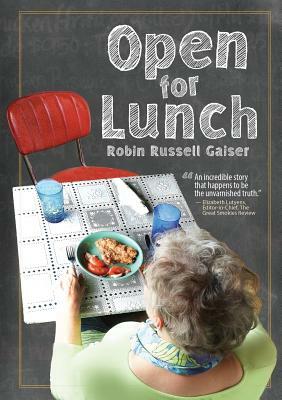 In her new book, Open for Lunch, Robin Russell Gaiser writes of her encounters with a dozen strangers in casual lunch spots from upstate New York to Asheville, North Carolina. She began these encounters almost by chance when she invited someone in line with her at a Subway restaurant to share her table. But as she pursued such encounters over the years, she gradually became "the reporter reporting on myself. Soon the stunning stories of my lunch mates took me deeply into my own narrative." Open for Lunch speaks from the heart, both about the moving, fascinating stories of the people she meets, but also about herself. In the words of Lois McMahon, PhD, "Gaiser is a survivor who has overcome personal tragedy and found healing and the ability to reach out to others to share her wisdom and strength. This book holds invaluable lessons for us all about pain, suffering, redemption, forgiveness, healing and love." Robin Russell Gaiser earned her B.A. in English at The College of William and Mary, where she also sang and played with a folk-rock group, both on campus and in venues in Richmond, Virginia, and Washington, D.C. After graduation she taught writing and literature in Fairfax County, Virginia; then, while raising her family, she gave private lessons in guitar and dulcimer and performed publicly under the auspices of the Fairfax County Council of the Arts and the Arlington Humanities Program. She also sang in classical choirs and joined The Mill Run Dulcimer Band, recording seven albums now included in the Smithsonian collection. With her children grown, Robin earned an M.A. in psychology from Marymount University and worked as a high school guidance counselor for eight years. Then, after relocating to upstate N.Y. and becoming caregiver—and bedside musician—for her dying father, she enrolled in a certification program for therapeutic musicians. As a Certified Music Practitioner (CMP), she is trained to provide live, bedside, one-on-one acoustic music to critically and chronically ill, elderly, and dying patients. After forty-three years in northern Virginia and eight years in upstate New York, Robin and her husband relocated to Asheville, NC, where she has pursued both her music and her writing. Her nonfiction has appeared in the women’s literary journal Minerva Rising (“Angels,” Dec. 2012) in three anthologies of short stories published by Grateful Steps Publishing: Drowning Allison & other stories (“Yellow,” 2012), The Cricket & other stories (“Doorways,” 2014), and Bits of Sugar & other stories (“I’ll Fly Away,” 2016); and in Writing in Circles: A Celebration of Women’s Writing, published by Sunburst Cabin Press (“Took Out the Tattered,” 2014). Her essay “How Music Led Me to Memoir” appeared on the blog, Memoir Writers’ Journey, published by Kathy Pooler, in 2014. She will write again for this blog on the November 19, 2018 posting. Robin was a guest columnist for the Great Smokies Review spring, 2018 issue with her piece, “Take Note.” Musical Morphine: Transforming Pain One Note at a Time (Pisgah Press; June, 2016), Robin’s first book, a memoir, was named a finalist in the Best American Book Awards for 2017. Robin was chosen to give a TEDx Talk titled “Good Vibrations: Less Drugs, More Music” on March 3, 2018, at UNCA. This talk is available for viewing on Robin’s website and on You Tube. She may be contacted via her website, www.robingaiser.com or email at robingaiser@gmail.com. [A]n artfully woven memoir of Gaiser’s family and personal landscape as well as her invited encounters with people she didn’t know... Throughout the telling of her inward journey are remarkable details that take the reader immediately to “place and circumstance.” The stories will also stay with the reader—from start to finish. A writer with many stories to tell. [Gaiser] write[s] economically—nothing extraneous to the scene—and with good focus. ...[A]n incredible, compelling, important piece.